George Heriot's School is a Scottish independent primary and secondary school on Lauriston Place in the Old Town of Edinburgh, Scotland, with over 1600 pupils, 155 teaching staff and 80 non-teaching staff. It was established in 1628 as George Heriot's Hospital, by bequest of the royal goldsmith George Heriot, and opened in 1659. It is governed by George Heriot's Trust, a Scottish charity. The main building of the school is notable for its renaissance architecture, the work of William Wallace, until his death in 1631. He was succeeded as master mason by William Aytoun, who was succeeded in turn by John Mylne. In 1676, Sir William Bruce drew up plans for the completion of Heriot's Hospital. His design, for the central tower of the north façade, was eventually executed in 1693. The school is a turreted building surrounding a large quadrangle, and built out of sandstone. The foundation stone is inscribed with the date 1628. The intricate decoration above each window is unique (with one paired exception - those on the ground floor either side of the now redundant central turret on the west side of the building). A statue of the founder can be found in a niche on the north side of the quadrangle. The main building was the first large building to be constructed outside the Edinburgh city walls. It sits next to Greyfriars Kirk, built in 1620, in open grounds overlooked by Edinburgh Castle directly to the north. Parts of the seventeenth-century city wall (the Telfer Wall) serve as the walls of the school grounds. When built the building's front facade faced the entrance on the Grassmarket. It was originally the only facade fronted in fine ashlar stone, the others being harled rubble, but in 1833 the three rubble facades were refaced in Craigleith ashlar stone. This was done as the other facades had become more visible with the new entrance on Lauriston Place. The refacing work was handled by Alexander Black the then Superintendent of Works for the school, who later designed the first Heriot's free schools around the city. The north gatehouse onto Lauriston Place is by William Henry Playfair and dates from 1829. The chapel interior is by James Gillespie Graham (1837) who is likely to have been assisted by Augustus Pugin. The school hall was designed by Donald Gow in 1893 and boasts a hammerbeam roof above the later mezzanine floor. The chemistry block to the west of the site was designed by John Anderson in 1911. The science block is by John Chesser (architect) and dates from 1887 incorporating part of the former primary school of 1838 by Alexander Black (architect). The grounds contain a selection of other buildings of varying age; these include a wing by inter-war school specialists Reid & Forbes, a swimming pool, now unused, and a granite war memorial, by James Dunn (1922) dedicated to the school's former pupils and teachers who died in World War I and World War II. On his death in 1624, George Heriot left around 25,000 Pound Scots – equivalent to several tens of millions today – to found a "hospital" (then the name for this kind of charitable school) to care for the "puir, faitherless bairns" (Scots: poor, fatherless children) of Edinburgh. The construction of Heriot's Hospital (as it was first called) was begun in 1628, just outside the city walls of Edinburgh. It was completed just in time to be occupied by Oliver Cromwell's English forces during the invasion of Scotland during the Third English Civil War; the building was used as a barracks, with horses stabled in the chapel. The hospital opened in 1659, with thirty sickly children in residence; its finances grew, and it took in other pupils in addition to the orphans for whom it was intended. By the end of the 18th century, the Governors of the George Heriot's Trust had purchased the Barony of Broughton, thus acquiring extensive land for feuing on the northern slope below James Craig's Georgian New Town. This and other land purchases beyond the original city boundary generated considerable revenue for the Trust long after his death. In 1837 the school founded ten "free schools" in Edinburgh, educating several thousand pupils across the city; these were closed in 1885. One of them, with a copy of several of the features of the original Lauriston Place building, is at the east end of the Cowgate (now serving as a Salvation Army hostel). In the 1880s, it began to charge fees; however, to this day it serves its charitable object, providing free education to fatherless children, referred to as "foundationers". In 1846 there was an insurrection in the hospital and fifty-two boys were dismissed. In 1979 it became co-educational with the arrival of the first girls, and now has around 1600 pupils. Today, the school is Edinburgh's best performing school by Higher exam results with leavers (in 2014) attending the country's most selective and prestigious universities including St Andrews (31), Glasgow (26) and Edinburgh (14) in Scotland and Oxford (2), Cambridge (4), Bristol (4) and King's College London (3) in England. Heriot's Hospital, Edinburgh by Henry Fox Talbot, 1844. The school also provided funds for the establishment of an institution which later merged with the Watt Institution (named after James Watt) in the 1870s to form Heriot-Watt College, a technical college that became Heriot-Watt University in 1966. Chronological list of the headmasters of the school, the year given being the one in which they took office. Thereafter, the title of Headmaster was changed to that of Principal. George Heriot's School has a wide range of extra-curricular activities in which pupils participate. The pipe band is headed by Pipe Major Willie MacIntyre, and around 120 pupils take tuition of some kind. The George Heriot's School Combined Cadet Force is headed by Lieutenant Colonel Bain, and around 60 pupils participate in weekly activities and summer camps. 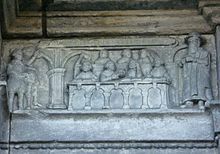 Carving of a 17th-century classroom with a dominie and his ten scholars. Positioned at the school's main entrance, the motto reads, DEVS NOBIS HAEC OTIA FECIT - "God hath given us this leisure".. Professor Adam Watt (b. ) - Head of Modern Languages at the University of Exeter. Colonel Clive Fairweather (1944 - 2012) - 2nd in command of the SAS during the Iranian Embassy siege. ^ "George Heriot's School - Edinburgh City". Scottish Schools Online. Archived from the original on 4 April 2013. Retrieved 13 May 2013. ^ "Facilities and Staff". George Heriot's School. Retrieved 13 May 2013. ^ "George Heriot and his Bequest". George Heriot's School. Retrieved 13 May 2013. ^ Colvin, Howard (1978). A Biographical Dictionary of British Architects 1600-1840. John Murray. ^ Colvin, Howard (1978). A Biographical Dictionary of British Architects 1600-1840. John Murray. pp. 569–70. ^ McWilliam, Colin; Walker, David; Gifford, John (1984). The Buildings of Scotland: Edinburgh. Penguin. pp. 179–82. ^ a b McWilliam, Colin; Walker, David; Gifford, John (1984). The Buildings of Scotland: Edinburgh. Penguin. p. 180. ^ "Architectural Detail and Tower". George Heriot's School. Retrieved 13 May 2013. ^ Gilbert, William Matthews (1901). Edinburgh in the Nineteenth Century. J. & R. Allan. ^ Appointment of Principal. "George Heriot's School". Retrieved 13 May 2013. ^ Appointment of Principal. "George Heriot's School" (PDF). Retrieved 16 December 2014. ^ "The Royal Scottish Pipe Band Association". Archived from the original on 4 June 2012. ^ Gowenlock, Brian G; B J Aylett; J C Bevington; D C Bradley; T S West; W P Richards; A G Hector (18 August 2004). "Obituary - Sir Harry (Work) Melville" (PDF). Royal Society of Edinburgh. Archived from the original (PDF) on 4 October 2006. Retrieved 30 November 2008. ^ "Biography:Professor Adam Watt". Exeter University. 2013. Retrieved 15 October 2013. ^ a b c d e f g h i j k l m "Spellbinding times at Heriot's". The Scotsman. 13 August 2009. Retrieved 28 October 2018. ^ "The Official Website of The British & Irish Lions - History - Ken Scotland". British and Irish Lions. Archived from the original on 24 October 2008. Retrieved 30 November 2008. ^ Connor, Jeff (22 February 2001). Giants of Scottish Rugby. Edinburgh, Scotland: Mainstream Publishing. ISBN 978-1-84018-478-5. ^ "Obituaries:Colonel Clive Fairweather". Daily Telegraph. 15 October 2012. Retrieved 15 October 2012. ^ Holgate, Andrew (15 February 2005). "Biography: John The Painter by Jessica Warner". London: The Times Online. Retrieved 22 December 2008. ^ "Hippolyte Jean Blanc". Retrieved 9 March 2014. This page was last edited on 8 March 2019, at 21:00 (UTC).